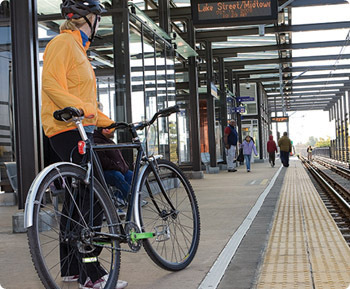 Bike racks are available on all Metro Transit buses, METRO Line trains and Northstar Line commuter trains. Walk — do not ride — bicycles at stations, on platforms and on trains. Bicyclists are required to use elevators or ramps (where available) to access station platforms. Pay your fare on the platform. After paying, walk your bicycle to the boarding area and wait behind the line. As a train approaches, position yourself to board. Each train car has four doors; the middle two doors are closest to the onboard racks. Wait for those getting off the train, then let others board before rolling your bicycle through the doors. There are two upright racks. If available, load your bicycle in the one farthest from the door. Position the rear wheel between the hoops of the lower rack and hook the front wheel at the top. Remove any unsecured items and collapse your seat post if possible. Stand with your bike or take a nearby seat. 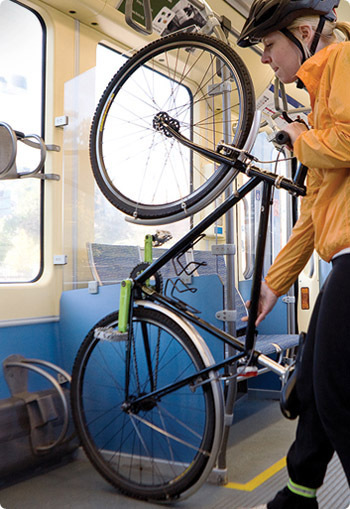 As you approach your stop, prepare to remove your bike from the rack as soon as the train stops moving. Allow others to exit before you unload your bicycle. To ensure safety, Metro Transit reserves the right to limit onboard storage of bicycles during special events or when trains are crowded. If there is no room for you and your bicycle on the train or the bike racks are full, wait for the next train.